The Cuisinart CGS-W18 is a 18-piece grill set that includes all the necessary tools to make grilling experience easy and convenient. This durable set of stainless steel tools includes a spatula, tongs, grill brush, 5 skewers, 8 corn holders, and a storage case. Each tool is designed with elongated handles and a hanging loop for convenient placement during grilling time. When you are finished grilling, store the whole set in the durable case until the next time you grill. The Cuisinart 18pc Wooden Handle Grilling Set has many exciting features for users of all types. 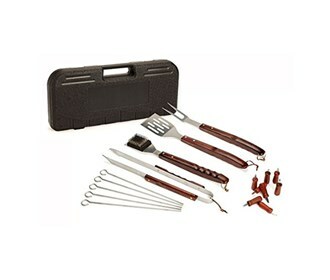 See the Cuisinart 18pc Wooden Handle Grilling Set gallery images above for more product views. 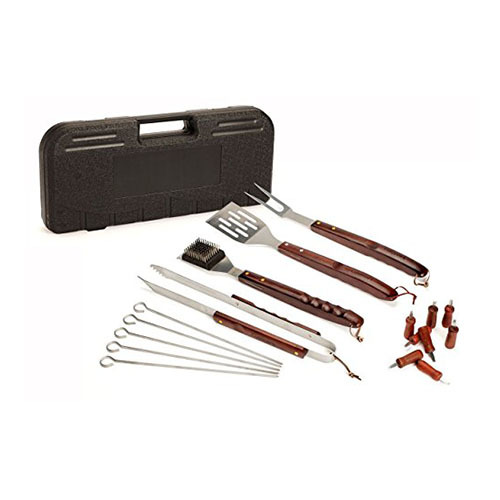 The Cuisinart 18pc Wooden Handle Grilling Set is sold as a Brand New Unopened Item.